Last week, the Central Bank of Nigeria (CBN) ordered MTN Nigeria and four banks to refund the sum of $8.134billion alleged to have been illegally repatriated out of the country back to its coffers. The order came like a thunderbolt. CBN, citing flagrant violation of Nigeria's extant laws and regulations, slammed a fine totalling N5.87 billion on Standard Chartered Bank, Stanbic-IBTC, Citibank, and Diamond Bank for helping the telecommunications' giant, MTN Nigeria to repatriate $8,134,312,397.63 illegally to its Johannesburg-based parent company over a nine-year period. According to the CBN, the remittances also contravened Nigeria's Foreign Exchange (Monitoring and Miscellaneous Provisions) Act, 1995 and the Foreign Exchange Manual, 2006. But before that, the apex bank had been investigating the matter for months and on Tuesday, August 28, wrote to MTN Nigeria, demanding for the refund of the said $8.134 billion to its coffers. Also, the four banks-Standard Chartered, Stanbic IBTC Bank, Citibank and Diamond Bank were fined N2.4 billion, N1.8 billion,N1.2 billion and N250 million respectively for their involvement in the illicit deal. MTN Nigeria, which has been battling a previous $5.2 billion fine in Nigeria, on Thursday, last week, rejected the sanction describing itself as a law-abiding corporate citizen of Nigeria that is committed to good governance and one that abide by the extant laws of the Federal Republic of Nigeria. Similarly, Diamond Bank Plc and Stanbic IBTC Plc listed on the Nigerian Stock Exchange (the other banks are privately held) also responded - both releasing statements about their financial stability despite the fine and that they are discussing with CBN to ensure the issue is resolved amicably. However, findings by LEADERSHIP showed that the apex bank resorted to sanctioning the telecommunications company and the banks after it conducted thorough investigations. Checks revealed that following allegations of remittance of foreign exchange with irregular Certificates of Capital Importation (CCIs) issued on behalf of some offshore investors in MTN Nigeria Communications Limited, the CBN carried out an investigation in Standard Chartered Bank Limited, Stanbic IBTC Bank Limited, Citibank Bank Nigeria Limited and Diamond Bank Plc in March 2018. The banks were alleged to have used irregular CCIs to illegally remit foreign exchange amounting to $8,134,312,397.63 on behalf of MTN Nigeria for nine years (between 2007 and 2015). A certificate of capital importation ("CCI") is a certificate issued by a Nigerian bank confirming an inflow of foreign capital either in the form of cash (loan or equity) or goods. A CCI is usually issued in the name of the investor within 24- 48 hours of the inflow of the capital into Nigeria. As soon as MTN Nigeria got its operating licence by the Nigerian Communications Commission (NCC) in 2001, its shareholders invested the sum of $402,590,261.03 in the company from 2001 to 2006. The investment was carried out through the inflow of foreign currency cash transfers and equipment importation, which was evidenced by the CCIs issued by banks. The CCIs issued at the time of the investment by the four banks to MTN Nigeria in respect of the $402,590,261.03 showed that $59,436,923.44 was invested as shareholders' loan and $343,153,339.56 as equity. However, a review of MTN's financial statements for the year ended December 31, 2007 revealed that $399,594,146.00 was recorded/invested as shareholders' loan and $2,996,117.00 as equity investment, in accordance with the shareholder's agreement but contrary to the CCIs issued by the banks. Findings also revealed that following a request by MTN Nigeria through Standard Chartered Bank for CBN's approval to convert the shareholders' loan to preference shares, an approval-in-principle was granted vide a letter from CBN dated November 13, 2007; with the grant of final approval made subject to the fulfilment of some conditions by MTN. These conditions include the implementation of the decision of MTN board resolution dated November 08, 2007 and submission of documentary evidence to that effect to the director, Trade and Exchange Department of the Central Bank of Nigeria. The condition also include the provision of an undertaking that no remittance for either interest or principal repayment would be made to the shareholders from the date of the loan to the date they were converted to preference shares. Investigations revealed that MTN could not fulfil one of the conditions and consequently, the apex bank did not issue a final approval. However, MTN Nigeria converted the shareholders' loan to preference shares with Standard Charted Bank issuing new CCIs in respect of the illegal conversion. Later, Standard Charted Bank in a letter to the CBN dated December 10, 2009 described the action as an "unintended omission." The CBN concluded that on account of the illegal conversion of MTN shareholders' loan to preference shares (interest free loan) of $399,594,146.00, the sum of $8,134,312,397.63 was illegally repatriated on behalf of MTN Nigeria by the banks between 2007 and 2015. Banking sources recall that upon the conclusion of CBN investigation, the Committee of Governors of the Central Bank of Nigeria met with the management teams of the banks and representatives of MTN in Lagos on May 25, 2018 with an aim to give all parties a fair hearing towards taking an informed decision on the matter. Consequently, after reviewing the report of the investigation and the submissions by MTN, the Committee of Governors of the CBN, ordered that the sum of $8,134,312,397.63 illegally repatriated by MTN on the basis of the illegally issued CCIs should be refunded to the coffers of the Central Bank of Nigeria with immediate effect. The CBN also discovered that Standard Charted Bank issued three CCIs outside the regulatory 24 hours without the approval of the CBN which is in contravention of Memorandum 24 (ii) of the Foreign Exchange Manual, which requires that CCIs should be transferred based on customer's instructions to a bank of the customer's choice along with the transaction history of the CCI. Standard Charted Bank was said to have provided confirmation to two other banks, Citibank and Diamond Bank, instead of transferring the CCIs to them as required by the Foreign Exchange Manual. The two banks on the strength of Standard Charted Bank confirmation subsequently remitted various sums as dividend for MTN Nigeria Communications Limited at different times. Standard Charted Bank was also said to have failed to issue a letter of indemnity to the CBN against double remittance in respect of ten CCIs transferred by Diamond Bank and Citibank to the bank as required under subsection 5(iii) of Memorandum 24 of the Foreign Exchange Manual. Yet, upon the conclusion of the investigation, the Committee of Governors of the Central Bank of Nigeria met with the management of Standard Charted Bank and the other banks as well as representatives of MTN Nigeria Communications Limited in Lagos on May 25, 2018. This was to give all the parties fair hearing, towards taking an informed decision on the matter before the bank was penalised. The apex bank alleged that the bank failed to issue a letter of indemnity to the CBN against double remittance in respect of twenty CCIs transferred by Standard Chartered Bank to Stanbic IBTC bank as required under subsection 5(iii) of Memorandum 24 of the Foreign Exchange Manual; and repatriated dividends totalling $905,260.20 in respect of CCIs illegally issued on the strength of locally sourced capital. 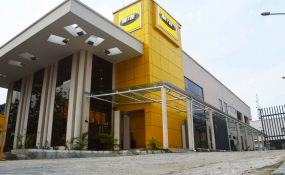 Investigations also revealed that a further review of the CCIs showed that no Form "M" was opened as evidence of the utilization of the FX for the importation of goods (as "Not valid for FX") into the country as the bank remitted the sum of $348,914,501.38 as dividend to MTN Nigeria Communications Limited offshore corporate shareholders without any documentary evidence of the audited account of the company to justify the basis of the payment of the dividend declared and paid by MTN, an action that was described as a violation of the provision of Memorandum 24(4) (b) of the Foreign Exchange Manual. Banking sources also revealed that Diamond bank failed to indemnify Standard Chartered Bank for losses and/or liabilities that may arise from the use of the CCIs transferred to Standard Chartered Bank in violation of the provisions of the Foreign Exchange Manual 2006 and issued three CCIs outside the regulatory 24 hours without the approval of the CBN contrary to provisions of Memorandum 22 of the Foreign Exchange Manual 2006; and illegally remitted the sum of $352,222,358.39 on behalf of Standard Chartered Bank and Stanbic IBTC Bank in respect of the various CCIs issued to MTN Nigeria Communications Limited. Four of the CCIs issued by the bank, sources said, evidenced the inflow of capital imported as cash were issued outside the period of 24 hours allowed by regulation upon the receipt of inflow, in flagrant contravention of Memorandum 22 of the Foreign Exchange Manual. The bank was also said to have failed to comply with extant regulations on the issuance of letter of indemnity to the CBN in addition to forwarding the transaction history of the CCIs to the CBN, as provided for in Memorandum 24(5)(ii)(b) of the Foreign Exchange Manual in respect of the CCIs received by the bank from Standard Chartered Bank; and purchased $535,000,000 on the basis of photocopies of Form "A" bearing the name of Standard Chartered Bank as the applicant bank and the referenced CCIs in contravention of Memorandum 24 (4) (a) of the Foreign Exchange Manual 2006. The apex bank warned MTN and the banks to be guided by the provisions of the extant laws and regulations of Nigeria in its foreign exchange transactions and to adhere strictly to them. A source in the CBN said the apex bank will live no stone unturned in ensuring ethical banking practices and strong adherence to the laws of Nigeria at all times. Announcing the decision in Abuja, CBN's director, Corporate Communications, Mr Isaac Okorafor, said in a statement that the actions of the apex bank became necessary following allegations of remittance of foreign exchange with irregular Certificates of Capital Importation (CCIs) issued on behalf of some offshore investors of MTN Nigeria Communications Limited and subsequent investigations carried out by the apex bank in March 2018. This issue first come into the open in Sept 2016 when Senator Dino Melaye raised a motion accusing MTN of illegal repatriation of $13.92 billion to its parent company through 4 banks from 2006 - 2016. The Senate then mandated its Committee on Banking, Insurance and other Financial Institutions to carry out a holistic investigation in compliance with the Foreign exchange (monitoring and miscellaneous) Act by MTN Nigeria and others.